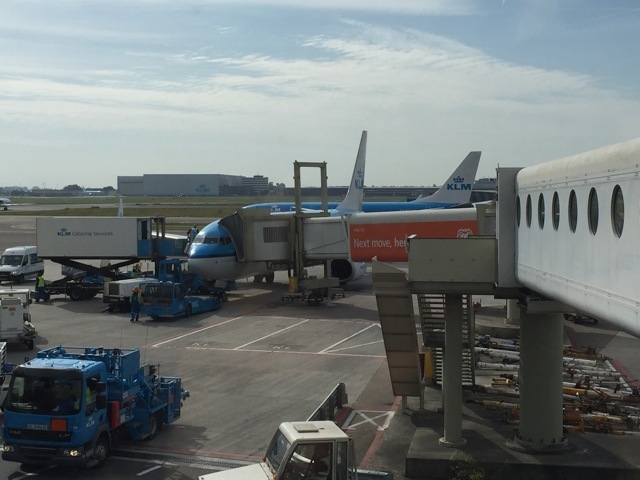 On Friday evening I arrived in Amsterdam on a flight from Warsaw. 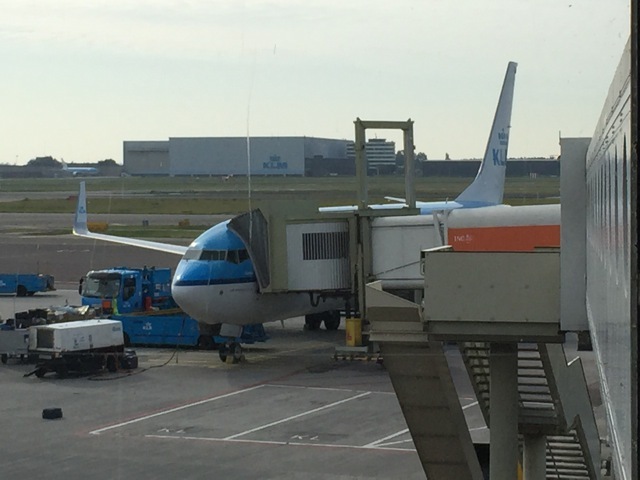 I spend a lovely weekend in Amsterdam enjoying the fine weather and today I shall continue my journey from Amsterdam to Zürich and from there on to Izmir, where I shall be giving a course. 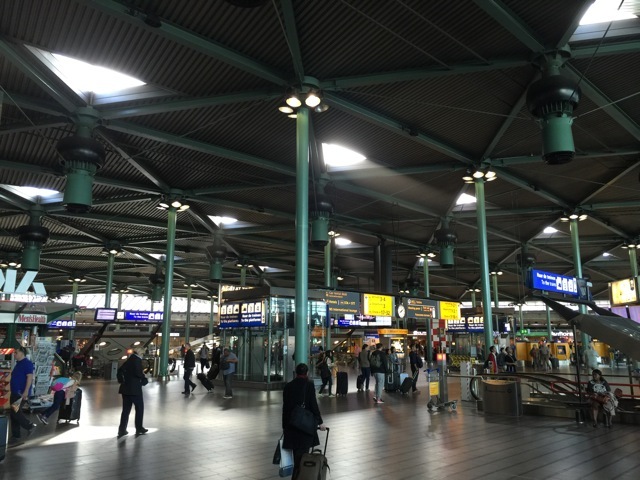 Arrives at: Amsterdam Schiphol airport. Frequency: From Central station to the airport there are trains roughly every 5 to 10 minutes. It is still early on Sunday morning. I leave the Sir Albert Hotel just after seven and make my way to the tram stop for the line 16 or 24 tram. Eventually, after waiting for about 10 minutes without even as much as hearing a tram, I consult the timetable, only to find that the first tram will not be arriving until 07:48. So I grab my suitcase and walk to the Museum square which is five minutes away. From there I take the tramline 5 to Central station. The journey to the railway station takes about ten minutes. From there I catch an intercity train to Schiphol, which makes the journey to the airport in about 15 minutes. Location: Departure Hall 1, one floor up from the Central Plaza. Facilities: Economy Class passengers check-in use the self-service facilities, which includes labelling and putting the suitcases on the conveyor belt yourself. For Business Class passengers and status holders, there are also staffed counters for check-in available. Security: There is a dedicated line for status card holders and Business Class passengers for security. I already checked in for my flight the evening before. 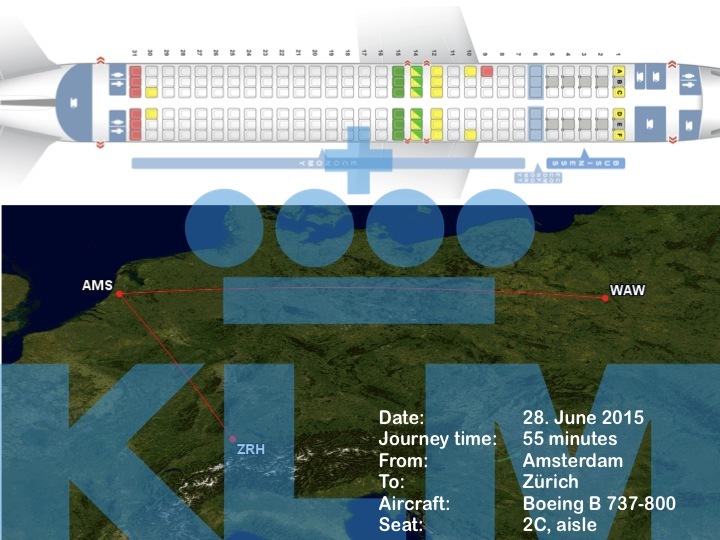 I do not know if perhaps KLM have made changes to their IT infrastructure recently, but for some reason the KLM app seems to be working surprisingly well these last few weeks. 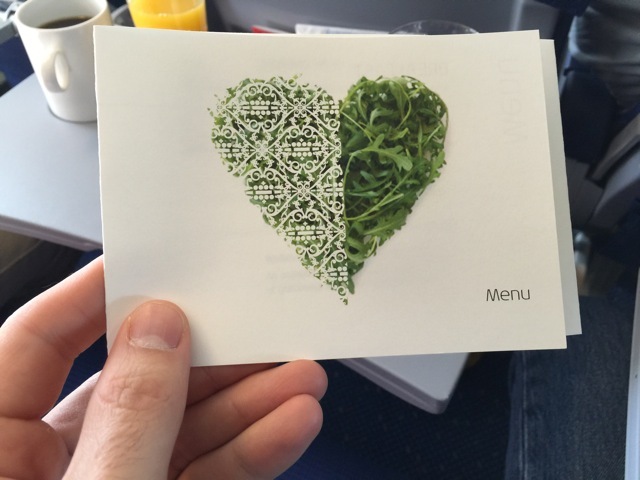 Even adding the boarding pass to Passbook works without a hitch. I arrive at the airport at about 08:15 and make my way to security. 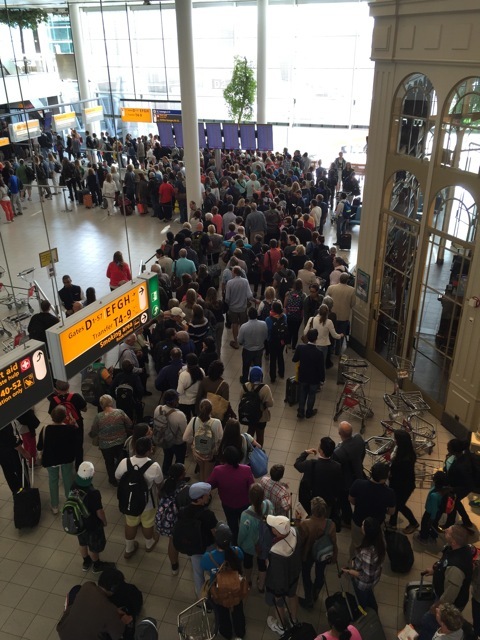 Personally I think Schiphol has one of the best organised security checks around. First of all, there always seem to be enough counters open to cope with all the passengers. So you never have to queue for very long. Secondly, the people who work here are always really friendly, unlike the frumpy, grumpy ex-KGB agents they tend to employ at many other airports these days. Location: One floor up from the public airside centre, at the beginning of the D dock. 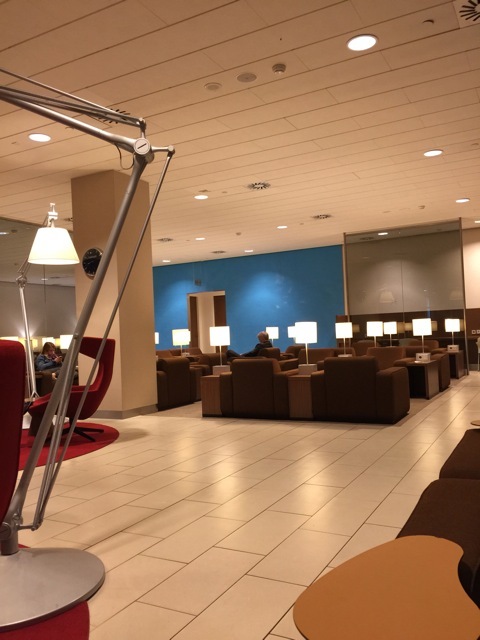 Type of lounge: KLM lounge for Business Class passengers and status holder. Facilities: Working stations, separate television watching room, toilets and showers available in the lounge. The lounge is divided in two parts. There is a smaller section at the back, which is only open at specific times or when demand makes it necessary. Catering: There is a selection of hot and cold dishes available throughout the day. The selection varies on the time of day. There is a second bar in the smaller section of the lounge. Hot food however, is only available in the larger, front section of the lounge. Internet: Free internet is available, password required. The Crown Lounge is already quite full, but not near as bad as on a Friday evening, when it can be difficult to find a place to sit. Fortunately, they have opened the back part of the lounge, which tends to be quieter that the main area due to the fact that the bar area at the back is only rarely open. 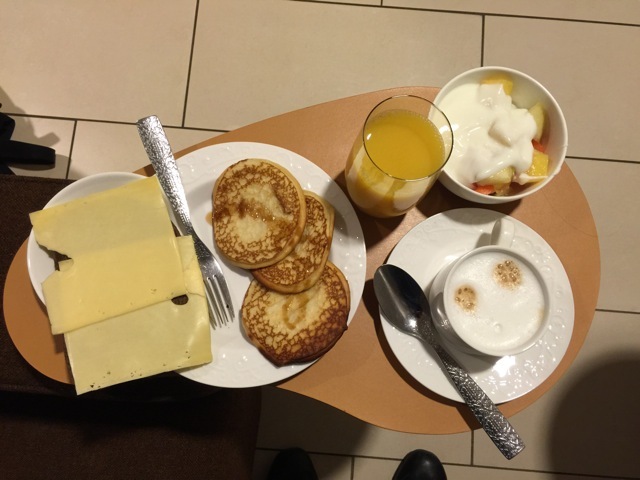 The breakfast selection is quite good, with a selection of bread, cheese and ham, yoghurt, fresh fruit salad and thick pancakes with maple syrup. Priority boarding: Business Class passengers and status card holders are invited to board the aircraft first. There is also a dedicated line for these passengers to queue. My flight will be leaving from C15, which is a 6 minutes walk from the lounge area. Originally, boarding should have started at 09h15. 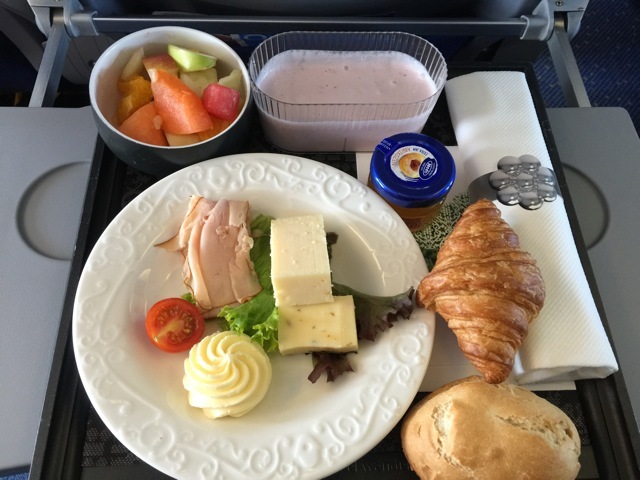 However, at 09h20 an announcement is made that due to some communication mishap, catering has yet to load the meals and therefore the flight will be running slightly late. Eventually we push back from the gate with a delay of 20 minutes. Even so, our arrival in Zürich is expected on time, thanks to a strong tail wind. Our flight time to Zürich is announced as 55 minutes. The flight this morning is completely full. I really do not think I have every seen anything like this. I am sitting on row two and the queue of people boarding the plane is seemingly endless. The purser tells me that indeed the flight is completely sold out, with not a single seat available. 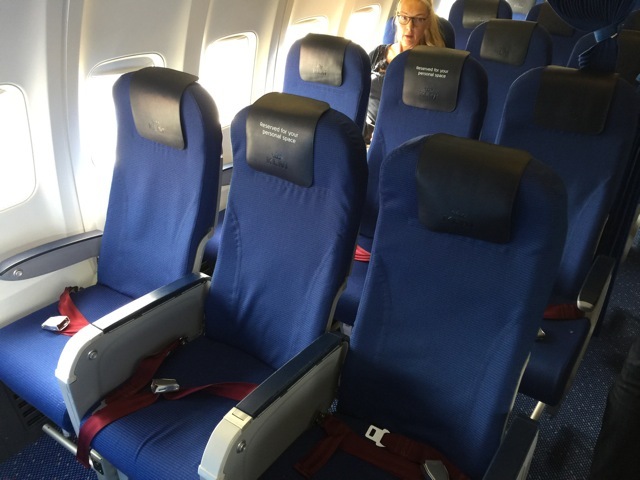 Seat: This is a bog standard European Business Class configuration with a row of three Economy Class seats on either side of the aisle. The middle seat is left empty and marked accordingly with a headrest. 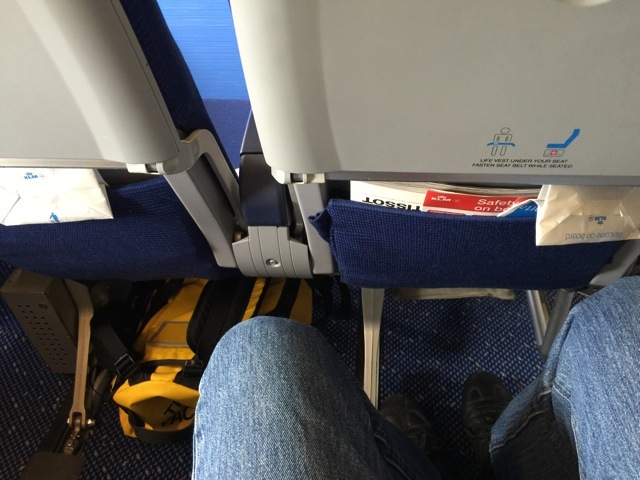 The seat is fairly comfy, even though it is quite thin and thus quite hard. 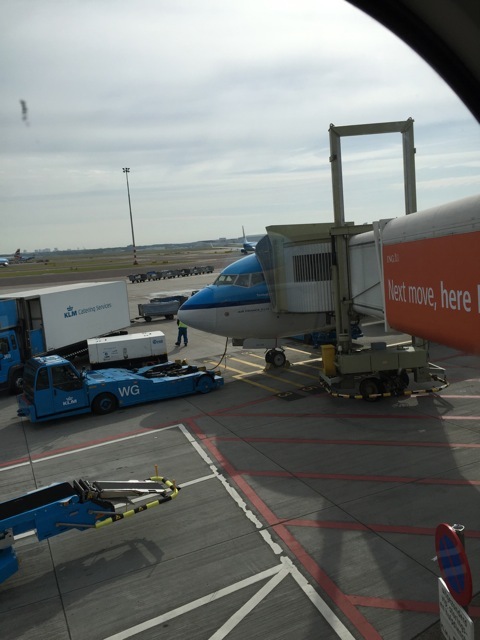 In typical Dutch style, the crew on this flight are all friendly and chatty. They are very relaxed. Some guy sitting at the back of the bus has forgotten or loss his iPhone at the gate. The crew even allow him off the plane twice to go look for it, before eventually it is time to leave and the doors close. 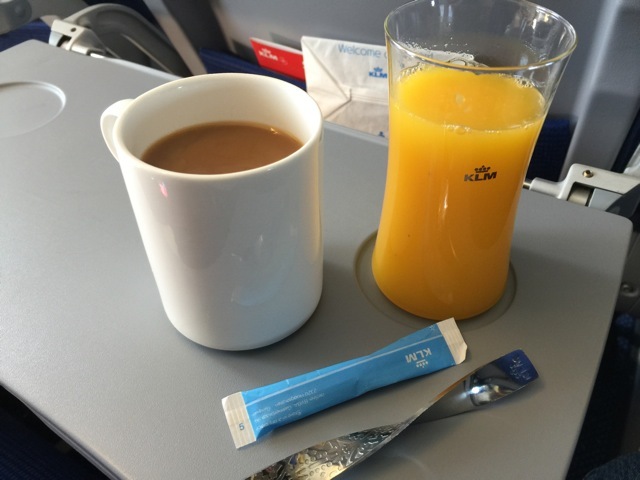 Throughout the flight, the crew take good care of passengers and make sure everyone is well-hydrated and nourished. Welcome drink on the ground: None. 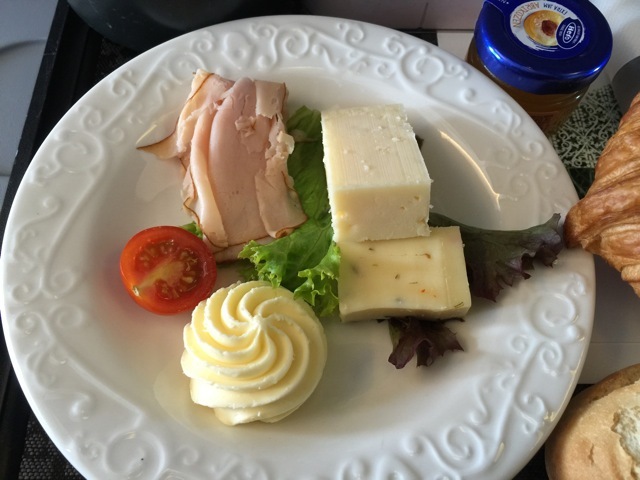 Plate of cold ham and a selection of cheese, served with butter. Selection form the bread basket – they came through the cabin three times. The meal hits the spot nicely. 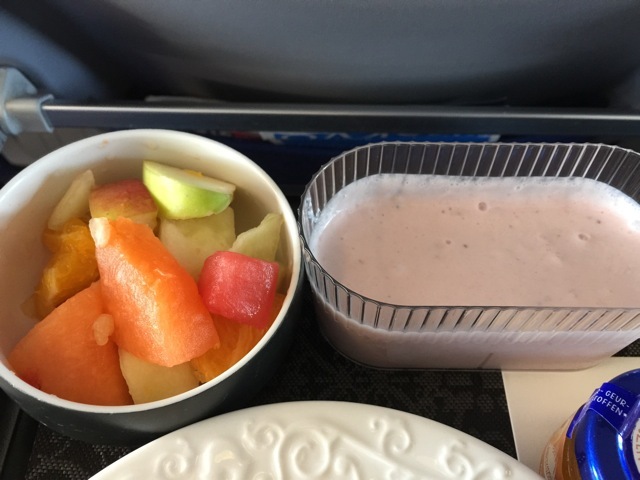 Okay, admittedly I had already eaten in the lounge but I am still starting to feel hungry again by the time we get airborne. 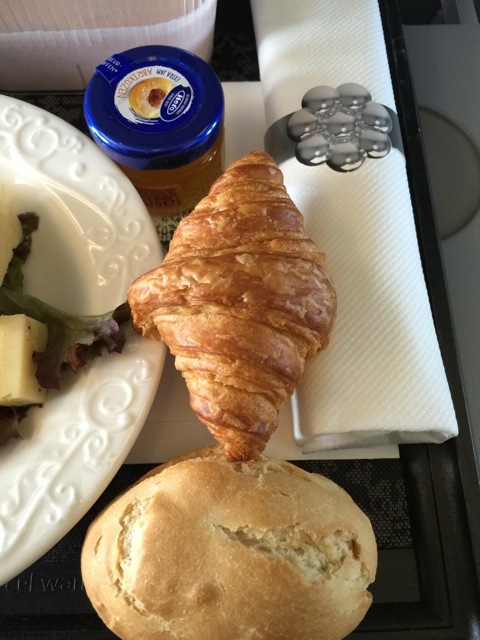 With a flight time of only 55 minutes, obviously the service does not take too long, and as soon I have finished my meal and the purser has checked that I will not be having a fifth croissant (I know…), he removes my tray and the crew start preparing for landing. We arrive at the gate at 11:05. There is a slight delay in getting the aircraft connected to an external power unit. Even so, we are still slightly ahead of schedule by the time we are allowed off the plane. But my journey is not finished here in Zürich. I now have one hour to buy a few things and exchange some money before I meet the valiant M. and we head off to give another course. 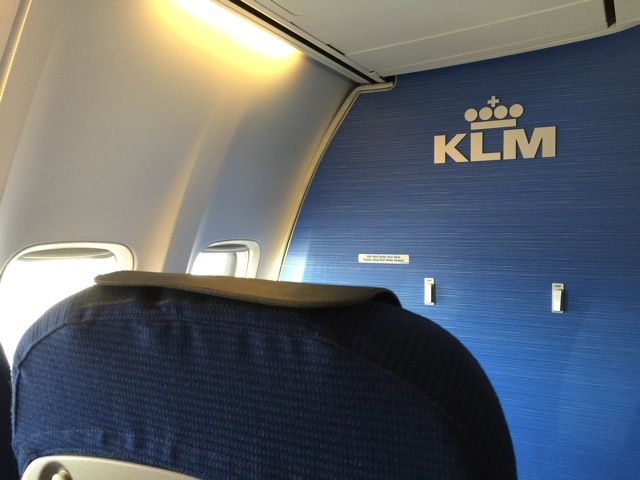 This entry was posted in Boeing B 737-800, Business Class, KLM and tagged airlines, Amsterdam, aviation, boeing b 737, Business Class, business class passengers, business class seat, departure gates, dutch airline, flying, KLM, klm aircraft, klm flight, transportation, travel, zurich airport. Bookmark the permalink.